2358 - Reprimanded by Commodore Stephen Baker for dereliction of duty. 2358 - Demoted by Commodore Stephen Baker for insubordination and conduct unbecoming of an officer. On another Earth, in the mid-20th century, a boy was born to Elias and Calista Volakou, whom they named Mackarios. They were a quiet family, living on another European continent, attending school and jobs, for many years. Unfortunately, their son Mackarios, was a bit of a hothead. He got into arguments in school, and fights after school. In their neighborhood, though he would play somewhat well with the other kids, if a dispute arose, Mackarios would use his fists before his mouth, or feet. This worried his parents to the point of seeing a doctor, who told them that it was normal for boys his age. In one instance, when Mackarios was eight, he got into an argument with his father, and tried to hit him. His father dragged him into a closet and locked Mackarios in until he was calmed down. The closet had a light, which was lit immediately so he wouldn't sit in the dark. There inside the closet, was an old radio and some tools, apparently thrown away while in the process of an attempted repair. Since there was nothing else to do, Mackarios began to work on the device to pass the time. His parents had all but forgotten about their son when they heard music wafting through the house from the closet. When they opened the closet, they found Mackarios, beaming from ear to ear, proud that he had fixed the radio of his own doing. When his parents realized his constructive abilities, they immediately set about teaching him how to use tools around the house and do a bit of woodworking in the meantime. Most of all, however, Mackarios loved to take electronic devices apart and see if he could put them back together. A few early attempts failed miserably, which resulted in his mother always having to wake his father for work from then on, but his skills improved over time. And then, one day, the whole world came crashing down. Mackarios was eleven when the outbreak of a dangerous virus occurred. The teenagers at school began to get sick, his teachers got sick, even his parents. The madness that struck the adolescent and adult inhabitants of that other Earth was terrible to watch, and worse to consider what was next. Mackarios and the rest of the neighborhood children soon learned that death quickly followed, leaving them orphaned and stranded. They banded together with several other neighborhoods, children of all ages, though most were at least aged five or so. The couple of three and four year olds were younger siblings of older children, most others, they figured, probably didn't know enough to get out of their houses and join them. Mackarios later learned the origin of the virus, though not for many centuries. He and the other children banded together, becoming the Onlies, one of many such groups scattered throughout the planet. They played foolies --games and pranks, for "fooling around"-- and scavenged the many abandoned areas of their city for food and other groups. Once in a while, they would meet another group, which would prompt an ongoing series of foolies between the two, until one group moved on to allow the other to scavenge there. Over time, the children's memories began to fade, forgetting their parents, their deceased siblings, and their lives before the virus. All that remained was play, and for the Onlies, play was life. Unlike his memories, Mackarios's love of tinkering did not cease. Every time their group would happen upon some electronic piece, he would collect it for later practice. When working batteries began to get scarce after the first century, Mac expanded to mechanical devices, making odd contraptions, much like his combination of kitchen utensils and a crank phonograph which would deliver a punch to the face of whoever cranked it. After their encounter with a group of Onlies in 2266, the Federation began sending medical teams and personnel to help the children recuperate. Many resisted at first, having no desire for their world of endless play to be over. Mackarios was one of those children, and he continued to play with his much-diminished group of Onlies. The Federation tolerated their behavior at first, but after an incident in the 2290s, most of the remaining pockets of Onlies were brought to the Federation Institute of their planet, designated by the Federation to be Miri's Planet. The Federation Institute of Miri, also called the Miran Institute and sister to the adjacent campus of the Miran Foster Home, instructed the Miran children with a standard education that Federation citizens received. By the time Mackarios attended, the curriculum had been mostly set with many successful results, but it still took the instructors several years to overcome the conditioning of the children, set in place by centuries alone without the presence of adults. Adjusting to a new way of thinking, new knowledge, and most of all, a new era, was difficult for Mackarios. His lessons proceeded slowly, and often he required private tutoring to stay at the pace of his classmates. In his free time, Mackarios began to tinker with some of the modern gadgets that the Institute provided him. Sometimes he would check the refuse bins to fish out equipment that had been thrown away, then to tinker and toy with it. Sometimes he would take them apart and try to put them back together, but after learning how Federation equipment worked (and the parts were generally standardized, making it simple to construct a toaster or a clock from similar parts) the excitement of that method began to fade. Sometimes he would salvage equipment for parts or just try to repair it. His instructors began to take notice of his hobby, and they soon developed an angle to better teach Mackarios. He was given a curriculum optimized for his learning style, which greatly increased his success in school. Within a few years, he had passed his classmates in his studies, finally completing his schooling at the institute in three years less time than the average. Like most of the Mirans, Mackarios worked with a counselor during his time at the Institute. The counselor helped him with behavior and similar issues at first, but as he progressed, the counselor began to focus more on helping Mackarios with interactions on a more adult level. By the end of his schooling, as he and his instructors, counselor and the Institute's commandant, met to determine what would happen to him next. A suggestion was made to become an engineer, due to his hobby, and his counselor encouraged Mackarios to apply to Starfleet, recommending that he would pass the required assessment of Miran children with ease, because of the success he'd had with the counselor. Mackarios was finally accepted into Starfleet academy in 2307. There he worked hard, but the classes were not tailored for him, and he soon fell behind. It took all of his determination and working with a counselor and several tutors to keep him from failing. He didn't graduate near the top of the class, or with his original classmates, but finally became a Starfleet Officer in 2312. His first assignment was to the USS Paraguay, a training vessel. He stayed there for two years, learning all he could and growing in maturity. His commanding officer, by the time he finally transferred to a permanent assignment, still put down on his record, "Likes to play minor pranks and frolic if not attended carefully. Recommend bunking with seasoned officer or regular visits with the counselor." The USS Edgar Allen Poe became his next home in 2314. On the Edgar Allen Poe, Mackarios received his first promotion, a full four years after graduating from the Academy. By 2320, he had transferred once again to the USS Pioneer, still as a regular Engineering Officer. He stayed aboard the Pioneer for five years, earning a promotion to full Lieutenant after two. His next assignment was his first in any sort of higher position. Mackarios was recruited to the USS Corus as the Assistant Chief Engineer, which he would serve in for six years. While he was slowly advancing, the greatest obstacle to promotions was his immaturity and childish behaviors, including pranks. Several of his Department Heads and Executive Officers remarked that an officer like Mackarios would likely never make it past the rank of Lieutenant or serve in any great position of authority. His behavior, they reported, was simply too unpredictable, and Mackarios was faced with threats of demotion or reprimands for disorderly conduct. Mackarios defied those odds in 2331, transferring to the USS Princeton as its Chief Engineer. There, he met a then-Lieutenant Commander Alexander Morin, the Chief Helm Officer and the ship's Second Officer as well. The two quickly formed a friendship and spent a great deal of time together, their friendship becoming a true bond. This bond tested itself when the Commanding Officer accepted a promotion to the Admiralty, promoting his Executive Officer in his place. The new Commanding Officer, a Tellarite, took an immediate dislike to the friendship between Morin, whom she'd promoted to Commander and her Executive Officer, and Mackarios. After several years, Morin convinced his superior officer that Mackarios was worthy of a higher post, and she promoted him to Lieutenant Commander, and to Second Officer of the ship. His new position didn't last very long, as two years later, in 2338, Morin took an offer to be the Commanding Officer of a ship, on the one condition that he could choose anybody to be his executive officer. To no surprise, he chose Mackarios, and both of them transferred to his new ship. Morin's ship was an aging Miranda-class vessel. Even though the class had been refit once already, the Agamemnon was still ancient in terms of modern technology and equipment. Their missions were generally to backwater Federation worlds, resolving issues that didn't need fancy flying or a dazzling show of phasers and torpedoes. Still, Mackarios enjoyed his time aboard the Agamemnon, until 2346, when Starfleet decided to mothball the ship to allow for new ships to combat the Cardassian threat. For nearly twelve years, Mackarios served under newly-promoted Captain Morin on his new ship, the Cheyenne-classed USS Agincourt as his executive officer, as he had on the Agamemnon. Those long years, the two formed a very workable bond. Morin understood Mackarios' personality, his quirks, and did his best to tolerate some of them. And Mackarios knew Morin's seriousness, and tried to balance that out with his erratic behavior. If he had wanted to, Mackarios could have landed a captaincy anywhere with Morin's recommendation, and it was his goal to eventually do so. However, Mackarios couldn't bear to leave Captain Morin, not with the kind of team the two made. On a mission to help resolve a dispute on a Federation world, Captain Morin was fatally wounded on an away mission. Instead of commanding the ship and trying to resolve the conflict, Mackarios stayed by Morin's side until he passed. The bond they had, the years and experiences they had shared, were too great to allow himself to follow his duty. After Morin died, Mackarios did his best to finish the mission, but ultimately Starfleet sent a member of the Admiralty to do what he could not accomplish. Commodore Stephen Baker was sent to resolve the dispute, after which he assumed command of the Agincourt. Baker and Mackarios were immediately at odds. Baker's first action was to reprimand the Miran for not completing his mission properly, putting too much time into staying next to Morin's deathbed. Mackarios was shocked at the senior officer's demeanor, and their relationship only deteriorated from there. When, several weeks later, Mackarios pulled one of his pranks on the crew, programming the mess hall replicator to turn anyone's dish into a plate of dead gagh, Baker demanded to know who was responsible. One of the crew, knowing Mackarios' fondness for the pranks, implied that it might be him, and Baker immediately summoned the Miran. Mackarios admitted playing the prank, reasoning that the crew needed a laugh after their Captain's death. The Commodore would hear none of it, warning that another prank would result in severe consequences. Mackarios scoffed at Baker, thinking that it would only be a short time before another Captain was assigned to take over the Agincourt. It wasn't for a few more days until another prank occurred, and again Baker summoned Mackarios. Instead, this time it was not his doing, but another crewmember's, one who shared the First Officer's notion for light-hearted pranks. Baker immediately demoted Mackarios to Lieutenant. When Mackarios tried to protest, Baker demoted him again, all the way down to Ensign, and informed him that he would be reassigned. Crushed by both his former Captain's passing, and humiliated by his demotion and reassignment, Mackarios spent only a few months on the USS Bermuda before giving up. He resigned his commission and retired from Starfleet, leaving behind the life he had known for over fifty years. Mackarios found an apartment on Risa and relocated there following his retirement. Risa had most every form of entertainment, which kept him busy and interested often enough. The entire planet was essentially a giant amusement park, and the child in him was let out full-force. For years, nothing drove him but the daily games with other children, exploring a new part of the planet, and even growing comfortable enough to play pranks on other inhabitants, even those in his own building. Although engineering was still a hobby of his, Mackarios had been in a command position for over twenty years, far too much time out of the engine room. Even his few months on the Bermuda couldn't do enough to update his knowledge, there were so many changes, new ideas and methods. The games occupied most of his time anyway, so even as a hobby, engineering would have been slow going. It was on Risa that Mackarios learned how to surf. He grew to love the sport and began to enter competitions. It was in these competitions that he became known for stealing other surfer's waves, and gained a notorious reputation for arrogance. In the final round of a heated competition, his closest competitor stole a wave from him, costing him the tournament. Angry and defeated, Mackarios gave up competition surfing. After five years, Mackarios grew bored of life on Risa. He journeyed to Miri's Planet on vacation, to see what his homeworld was like a half-century after his departure, and found a very different world. Most of the Mirans had been educated through the Miran Institute now, and it stood mostly defunct. Some Mirans had left, but most stayed, resuming the normal course of life for them as in the past few centuries. Of course, now the Mirans had new technology, and instead of foolies in the streets, they played foolies in state-of-the-art holodecks. They raced atmospheric shuttles and pranked each other with random transportations to far-off cities. Mackarios became enthralled in the life of a Miran again, and absorbed himself into the world once more. The years passed again, and Mackarios grew bored with endless play. He had experienced work, a life in Starfleet, and accomplishments. Play, although enjoyable and something to be passionate about, didn't quite give him the satisfaction that Starfleet had. Miri's Planet was governed by a legislative body, the Council of Youngers. Though the elections were generally just popularity contests between best friends, Mackarios ran. And surprisingly, he won his first time. The Council of Youngers was really nothing more than a playhouse with little work actually being done. Mac's first session determined that ice cream would be served daily at 3:00 PM instead of 4:00 PM and that any remaining bedtimes would be completely eliminated. Future sessions ensured that the children were never involuntarily served any vegetable that was green, yellow, red or purple, and absolutely forbade the import of Lima Beans and Cod Liver Oil. Still, amidst the play, some work was being done. Mackarios still didn't feel completely satisfied, but his terms in the Council felt more comfortable than endless vacation on Risa or outside the Council on Miri's Planet. While on Miri's Planet, Mackarios began to teach other Mirans how to surf. Several of his students became quite talented in their own right, and Mackarios decided to hold a competition. During the competition, one of his brightest students decided to begin stealing other surfers' waves, forcing Mackarios to disqualify him from the tournament. The episode hit Mackarios hard, and as the competition drew to a close, he pondered the real reason he had lost the tournament on Risa, and why he had lost his career in Starfleet. Mackarios discovered some hard truths about himself, and because of them, he committed himself to returning to Starfleet. 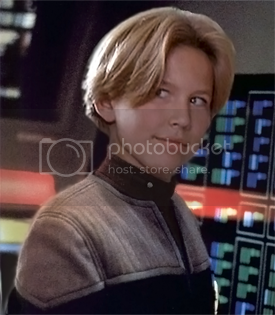 In 2382, Mackarios returned to Starfleet and enrolled in the Starfleet Academy Master's Program. He studied in the Tactical division, rather than re-entering the Engineering field, figuring that it was time to find a new direction and give himself new opportunities with a different career. He graduated, on time, in 2384, and was assigned to the USS Prominence. After serving for the last few months of the Hydran War on the Prominence, Mackarios transferred to the USS Galaxy. Pride is central to Mackarios' work, he does what he does with a passion and his pride shows through. In the past, he was something of a braggart and definitely a little arrogant, for when he does a good job, Mackarios likes others to recognize that it was his doing. When he found himself criticized, however, he was like to lashing out aggressively, through words, fists or some other form of retribution. It took several personal failures for Mackarios to realize that it was his behavior that caused his own downfall, and since then he has worked hard to be a more amiable person. Academic learning is usually a slow process for Mackarios, books and research is not his strong point. Whenever he attempts to learn or practice a hands-on skill, however, his retention and rate of advancement increases. A practically-applied academic skill, thus, has more merit to him than a theoretical academic skill. Much like any Miran, Mackarios is still a child at heart. And while he has learned professionalism, his childish tendencies still surface occasionally at times when he should be working, despite his efforts to keep it in check. Off duty, he generally allows it to run rampant, by engaging in games with other children or even other officers on the holodecks. Mackarios is a light-hearted person with a well developed sense of humor. He will often inject humor into a situation to lighten the mood, by jokes or pranks of some manner, or acting in a humorous way. While most students in Starfleet Academy took the time to learn the languages of the founding Federation races, or a race with which they closely associated or admired, Mackarios, instead, learned Federation Sign Language (which closely resembles American Sign Language from Earth). He was inspired by a lecture guest hosted by a prominent Deaf individual of the Plaeties system, and chose sign over the myriad of languages the Academy had to offer. Biopic: Headshot courtesy of Jonathan Taylor Thomas. Image manipulation by Ray. Experience: About 7 years of experience writing off and on in various RPGs, Trek or not. Mackarios, nicknamed Mac, is a Miran (also called Onlies) from Miri's Planet, a planet visited in the Original Series episode "Miri." Much like other members of his race, he is a prepubescent child both blessed and cursed with a prolonged lifespan. After Mac was educated and treated for the trauma he'd experienced in three centuries of life on Miri's Planet at the new instutitions built by the Federation, he attended Starfleet Academy at the turn of the 24th century. He majored in Engineering and was graduated to the fleet in 2312. During his career in Starfleet, Mac served on several starships, gradually working up the ranks and positions until he became the Executive Officer of a starship. After his CO's death, Mac had a dispute with the ranking Admirilty, and was demoted. This caused his departure from Starfleet in 2362. During his retirement, Mac lived on Risa, and then back to his homeworld, where he eventually served on the Council of Youngers, the planet's ruling body. After a time, he grew bored and increasingly unsatisfied, and thus returned to Starfleet in the 2370s. Mac graduated a second time from the Academy in Security, and after serving on a few starships, reached the Galaxy. Mac is a prideful, almost egotistical or arrogant, person, and he likes to be recognized and appreciated. If he doesn't get that, or receives criticism, he can lash out aggressively. He is, though, still a child, in both heart and body, and he struggles with balancing professionalism with playfulness. He is fond of playing pranks on people, and will engage in a game of just about anything with just about anyone. His motivation primarily stems from his endearment to the Federation for lifting him from his life on Miri's Planet and granting him a whole new galaxy to discover. It was the mark of sovereignty, a planet's right to choose its own leadership. For the inhabitants of Rutenali IV, that right was now in limbo. The aging monarch, having served her planet for the entirety of her adult life, wished to impose a democracy as her last ruling act. Her son, the Crowned Prince, opposed his mother's wishes and had begun corralling his supporters to defend the monarchy. The Queen's ministers, however, accused the Prince of being illegitimate and not the legal heir, claiming that the pro-democratic brother of the Queen was instead. The planet's population had become embroiled in the conflict, and it was only a matter of time before fighting erupted. In an effort to distill the conflict, Starfleet had dispatched the USS Agincourt. It had been three days since they had arrived at the planet. Only three short days, it was astounding how just three simple days could change the entire course of someone's world. Commander Mackarios Volakou desperately wished he could order a slingshot maneuver around the system's star in order to reverse the events of those three days. During those three days, he had lost more than just his Captain, but also his friend, his mentor and, as it felt right now, part of himself. Seated on the floor of his quarters, Mackarios was posed in the form taught to him by Lieutenant T'vrek, the Chief Engineer. She had insisted that his lack of discipline would interfere with their working relationship. After countering his tongue and fists, which ultimately landed him on his back, an embarrassing position indeed, Mac agreed to T'vrek's suggested instruction in meditation. It wasn't helping now, even after the great effort the boy went to in order to earn his teacher's approval. The candles were lit, the robes were donned, and the recitation was precise. Even so, Mackarios could not bring himself to enter the heightened state of mind, his was too focused on the tears staining his cheeks, the streaks like brushstrokes on canvas portraying the grief in his heart. He had stayed by his Captain's side for almost a day, in spite of the fact that, as Executive Officer, it was his duty to perform the duties of a Commanding Officer. In his mind, Mac had a duty to Morin first, his friend and comrade, before any fatuous political dispute. He begged his friend not to die, and screamed at the Agincourt's finest doctor to save his Captain. It was all for naught, Captain Morin died regardless. Grief was no stranger to this child, this survivor of centuries filled with hunger and disease on his homeworld. Yet this grief came with an added burden, a weight that seemed to bear down on the Miran boy's head, shoulders, chest and even his hands and feet. There had to have been some way that he could have stopped this from happening. When the two factions on the planet refused to meet on the Agincourt, Morin had agreed to beam down to mediate. Mac had argued against it, citing his responsibility to protect his Captain, but Morin would have none of it, alluding to their close friendship as reason to trust his judgement. Thus, grief was joined with guilt to create an ugly monster, one so despicable that it outclassed the Borg, the Dominion and even the Grups. It wrapped itself around his chest, like a constrictor, and sat itself down on his head as an iron helmet. By choosing Mac as its victim, the boy had refused to leave sickbay even after his friend's death. He refused to see any of the leaders of Rutenali IV or meet with his crew. The boy's only comfort was grasping the cold hand of his deceased friend, now only an empty corpse. Only after the Chief Medical Officer had enlisted the help of the Chief Engineer to break Mac's seal on the sickbay doors, and with the help of a team of Security officers, had Mac been brought away from Morin's side and to his quarters. In his mind, the boy relived his friend's dying words. A plea, a hope, that his death would not bring about the end of stability on Rutenali IV. If nothing else, the Miran had to admire his Captain's dedication. When Mac uttered his agreement, Morin only returned a stare. He knew Mac too well to take a small utterance as complete agreement. Their relationship was hard and not without struggles. It had not been easy to stay friends as Captain and Exec, to live through their disagreements and put up with each other's professional styles. Morin knew Mac's style well, he knew what would follow, despite the Miran's words. The boy had forced a smile to his friend, put on a 'brave front' (as someone once told him) and only replied, "Kretas aei pseustai, Alex." Cretans always lie. Those were the parting words to his Captain, his friend of over 25 years. Those were the words that would haunt him for the rest of his life. I have also led my own Narnia-themed RPG, called Into Narnia. Currently it is suffering due to activity, but hopefully it will come back full force. Please take a moment to explain why you have chosen to join us: I have chosen to join you, Bravo Fleet, TF72, because having simmed in NEO already, I like the kind of simming experience that Bravo Fleet provides. I'm certain I would find that in TF72 as well, and in any TF in Bravo Fleet. Mackarios is only four feet eight inches tall, standard for his apparent age, but shorter than most officers in Starfleet. His features are a marriage of browns, his eyes, hair and skin tone all display a shade of brown. He has a medium build, not stocky but also not too thin. When off duty, he dresses in the typical clothes of his years, garments fashionable for young males in the galaxy. He tends to favor earth-tone colors, browns, darker greens, etc. in his clothing, and to a lesser extent the color blue. His attire on duty rarely wavers from the standard uniform, though sometimes he allows his uniform to look more casual. Pride is central to Mackarios' work, he does what he does with passion, and his pride shows through. He is somewhat of a braggart, and perhaps a little arrogant, for when Mackarios does a good job he likes others to recognize that it was his doing. His pride can turn on the defensive, though, if someone criticizes his work. Mackarios tends to lash out aggressively, through words, fists or some other form of retribution. Mackarios is, much like any Miran, still a child at heart. And while he has learned professionalism, his childish tendencies still surface occasionally at times when he should be working, despite his efforts to keep it in check. Off duty, he generally allows it to run rampant, from playing pranks on other crewmembers (with varied reactions) to games with other children or even other officers on the holodecks. Humor is Mackarios' coping mechanism. When he feels negative emotions, or senses that others around him are, he tries to lift spirits by way of jokes, pranks or acting in a humorous manner. On another Earth, in the mid-20th century, a boy was born to Elias and Callista Volakou, whom they named Mackarios. They were a quiet family, living on another North American continent, attending school and jobs, for many years. During this time, like many other children, Mackarios took the nickname "Mac." Partially because the younger children had problems pronouncing his name, and partly to put aside his past, Mac became his primary name, while Mackarios faded into disuse, and eventually from memory altogether. Unlike his name and his memories, Mac's love of tinkering did not cease. Every time their group would happen upon some electronic piece, he would collect it for later practice. When working batteries began to get scarce after the first century, Mac expanded to mechanical devices, making odd contraptions, much like his combination of kitchen utensils and a crank phonograph which would deliver a punch to the face of whoever cranked it. After their encounter with a group of Onlies in 2266, the Federation began sending medical teams and personnel to help the children recuperate. Many resisted at first, having no desire for their world of endless play to be over. Mac was one of those children, and he continued to play with his much-diminished group of Onlies. The Federation tolerated their behavior at first, but after an incident in the 2290s, most of the remaining pockets of Onlies were brought to the Federation Institute of their planet, designated by the Federation to be Miri's Planet. The Federation Institute on Miri, also called the Miran Institute, instructed the Miran children with a standard education that Federation citizens received. By the time Mackarios attended, the curriculum had been mostly set with many successful results, but it still took the instructors several years to overcome the conditioning of the children, set in place by centuries alone without the presence of adults. Adjusting to a new way of thinking, new knowledge, and most of all, a new era, was difficult for Mackarios. His lessons proceeded slowly, and often he required private tutoring to stay at the pace of his classmates. The USS Los Angeles became his next home in 2314. On the Los Angeles, Mackarios received his first promotion, a full four years after graduating from the Academy. By 2320, he had transferred once again to the USS Pioneer, still as a regular Engineering Officer. He stayed aboard the Pioneer for five years, earning a promotion to full Lieutenant after two. Mackarios defied those odds in 2331, transferring to the USS Princeton as its Chief Engineer. There, he met a then-Lieutenant Commander Alexander Morin, the Chief Helm Officer and the ship's Second Officer as well. The two quickly formed a friendship and spent a great deal of time together, their friendship becoming a true bond. This bond tested itself when the Commanding Officer accepted a promotion to the Admiralty, promoting his Executive Officer in his place. The new Commanding Officer, an Andorian shen, took an immediate dislike to the friendship between Morin, whom she'd promoted to Commander and her Executive Officer, and Mackarios. Morin's ship was an aging Miranda-class vessel. Even though the class had been refit once already, the Edgar Allen Poe was still ancient in terms of modern technology and equipment. Their missions were generally to backwater Federation worlds, resolving issues that didn't need fancy flying or a dazzling show of phasers and torpedoes. Still, Mackarios enjoyed his time aboard the Edgar Allen Poe, until 2346, when Starfleet decided to mothball the ship to allow for new ships to combat the Cardassian threat. For nearly twelve years, Mackarios served under newly-promoted Captain Morin on his new ship, the Cheyenne-classed USS Agincourt as his executive officer, as he had on the Edgar Allen Poe. Those long years, the two formed a very workable bond. Morin understood Mackarios' personality, his quirks, and did his best to tolerate some of them. And Mackarios knew Morin's seriousness, and tried to balance that out with his erratic behavior. If he had wanted to, Mackarios could have landed a captaincy anywhere with Morin's recommendation, and it was his goal to eventually do so. However, Mackarios couldn't bear to leave Captain Morin, not with the kind of team the two made. Baker and Mackarios were immediately at odds. Baker's first action was to reprimand the Miran for not completing his mission properly, putting too much time into staying next to Morin's deathbed. Mackarios was shocked at the senior officer's demeanor, and their relationship only deteriorated from there. When, several weeks later, Mackarios pulled one of his pranks on the crew, programming the mess hall replicator to turn anyone's dish into a plate of dead tagh, Baker demanded to know who was responsible. One of the crew, knowing Mackarios' fondness for the pranks, implied that it might be him, and Baker immediately summoned the Miran. Mackarios admitted playing the prank, reasoning that the crew needed a laugh after their Captain's death. The Commodore would hear none of it, warning that another prank would result in severe consequences. Mackarios ignored Baker, thinking that it would only be a short time before another Captain was assigned to take over the Agincourt. It wasn't for a few more days until another prank occurred, and again Baker summoned Mackarios. Instead, this time it was not his doing, but another crewmember's, one who shared the First Officer's notion for light-hearted pranks. Baker immediately demoted Mackarios to Lieutenant Commander. When he tried to protest, Baker demoted him again, to Lieutenant Junior Grade, and informed him that he would be reassigned. Crushed by both his former Captain's passing, and his demotion and reassignment, Mackarios spent a few months on the USS Bermuda before giving up. He resigned his commission and retired from Starfleet, leaving behind the life he had known for over fifty years. Mackarios found an apartment on Risa and relocated there following his retirement. Risa had most every form of entertainment, which kept him busy and interested often enough. The entire planet was essentially a giant amusement park, and the child in him was let out full-force. For years, nothing drove him but the daily games with other children, exploring a new part of the planet, and even growing comfortable enough to play pranks on other inhabitants, even those in his own building. Although engineering was still a hobby of his, Mackarios had been out of the field for over twenty years. Even his few months on the Bermuda couldn't do enough to update his knowledge, so much had become outdated. The games occupied most of his time anyway, so even as a hobby, engineering would have been slow going. After years of a growing urge to return to Starfleet, Mackarios finally did in 2376. He returned to the Academy as a graduate student and studied Operations, both in an attempt to familiarize himself with modern systems, as well to give him more opportunities with a different career. He graduated, on time, in 2378 from his two-year Masters degree program. The graduation also came with a promotion, to Lieutenant, and the choice of any ship in the fleet. Mackarios chose the USS Prominence, a Norway-classed vessel. The ship was commanded by a Bolian named Tixt, a former member of the Agamemnon crew, who at the time had been just a normal Science officer. Although the two never developed quite the same bond that Mac once had with his friend Alex Morin, their relationship was strong enough to ensure that Mackarios became the new Chief of Operations when the original officer transferred to another ship. His relationship with Captain Tixt improved and grew stronger, and they became good friends. The Miran learned that Tixt had opposed Commodore Baker's demotion of Mackarios, and left the ship soon after. Tixt thought Mackarios was a worthy officer, certainly one worthy of being an Executive Officer. So when the current Executive Officer accepted a promotion and ship, Tixt asked Mackarios to step into the role. The USS Prominence was Mackarios' home for eight years, until he was offered a Command in Fourth Fleet. Parting with his good friend, Mackarios accepted the command. I would try to approach worthy candidates that I found individually, however that method would likely not produce a stable crew. In the end, I would have to rely on ads and networking to do most of the recruitment. However, for each new player, I may attempt to contact them before accepting. I would require a writing sample, and from this as well as my conversation with them, I would attempt to judge their level of quality. And then I would also let them try it out, if they weren't able to produce quality writing, then I would encourage them to find a simm with players closer to their writing level. I would speak with the player and remind them that this is a game, and that part of the enjoyment derives from abstracting oneself from their character's direct reactions. Players need to realize that the same emotion they feel can be turned into inspiration for a post, if done carefully. Eventually, I would hope that the player would mature in realization enough to avoid any future issues. I would remind the player that the simm's rating is 13+ (or whatever it actually is) and to consider that there may be players as young as the minimum age. If the software allows, I would ask the player to tone down their post, either glaze over details, fade to black or replace the real world profanity with something in-universe. And I would ask the player not to write posts of a similar nature in the future. AIM: To provide multiple signatures for [acronym=Account Per Player]APP[/acronym] [acronym=Role-Playing Games]RPGs[/acronym], or users who want to display a different signature in different boards (like one for a support board, one for a graphics board, one for a hosting board, etc). -Separate the signatures from the Forum Profile page, give them their own page. AIM: To set permissions for a group to view certain BBC tags. The main ones are URL, Code, Email, FTP and other linkable/tags with links in them tags.